Only one waiver will be carried forward into Discovery’s upcoming Orbiter Rollover/Mate Review (ORMR) – relating to the Ku-band system – as the veteran orbiter edges closer to departure from her Orbiter Processing Facility (OPF-3). Discovery remains on track for a September 8 rollover to the Vehicle Assembly Building (VAB) for mating with her External Tank (ET-137). With only 38 IPRs charged against her flow since returning from STS-131, Discovery’s final flight processing flow inside the OPF has proceeded relatively smoothly. The next key milestone will be the ORMR, which will be conducted at the Kennedy Space Center (KSC) on September 1. Recent highlights for this latter part of her OPF flow include orbiter closeouts and the closure of the Payload Bay Doors (PLBDs) for rollover, the completion of structural leak checks on the OMS (Orbital Maneuvering System) pod, along with final work on her heatshield – which has continued through this weekend. “Potable water servicing is complete to date. ET Umbilical door closeout functional test was completed. MSBLS (Microwave Scan Beam Landing System) magnetron test and orbiter power redundancy test (in work). Aft and Forward closeouts for rollover are in work and will continue through the week,” noted the NASA Test Director (NTD) processing update (L2). The latest IPR – a known condition – remains under evaluation, but holds no constraint for the upcoming rollover to the VAB. “New IPR-0038: During the Vac-Ion pump run, the H2 tank 4 vacuum signal exhibited dropouts. Dropouts of ~25 percent occurred 3 separate times during the 4 hour run time with the longest lasting 58 seconds,” added the NTD update. 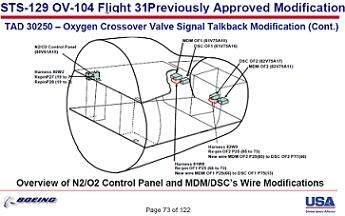 Good news has been reported by the NTD and KSC Ground Operations on a number of recent issues that have been in-work over the past few weeks, with confirmation the problem with the misbehaving Valve Position Indicator (VPI) on the O2 cross-over valve system has been closed – as was expected. Engineers have also completed the changeount of the C/L (Centerline) latch 1-4 Power Drive Unit (PDU) – which stalled when moving to the latched position during a cycle of the PLBDs. The failed PDU was replaced by a recently refurbished unit from the NSLD (NASA Shuttle Logistics Depot). “The RH PLBD Centerline Latch Power Drive Unit (PDU) retest was successfully completed,” added the NTD, allowing for the next step to complete the final closure of the doors ahead of rollover. They are next scheduled to be opened at the pad when Discovery receives her STS-133 payload. One final issue had to be worked to allow for the PLBDs closure, however – relating to the final stowage of the Ku-band antenna. The Ku-band system has been undergoing troubleshooting for some time inside the OPF, as engineers worked on pinpointing the exact cause of the system failing the angle rate/pitch rate portion of a recent self test. 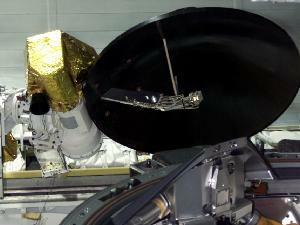 The system also suffered from issues with Discovery during STS-131. As suspected, the fault was tracked to one of the system’s two Electronics Assemblies (EA), and encouragingly this issue is only occurring in its self test circuitry. With a successful radar tracking test – cleverly conducted by bouncing a signal off the OPF’s ceiling – the system will receive a one-flight waiver to clear the constraint. With Discovery’s STS-133 flight set to be her last, it is unlikely any more work will be conducted on this fault, unless the hardware is required as a donation for one of her sister orbiters. “IPR-0037 (Ku-Band Failed Self-test) update: The Ku-Band (team) has come to the conclusion that the failure is isolated to LRU (Line Replaceable Unit) EA-1 Self-test circuitry only,” the NTD reported. “The system has nominally tracked a radar return off the ceiling in the OPF. This allowed for the final stowage of the Ku-band system, soon followed by PLBD closure for rollover. “Had an ORMR with Orbiter on Friday. 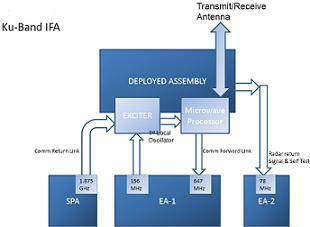 Have a few items in work: Have the Ku-Band Failed EA1 Self-test. Have a waiver going forward to the Daily prior to the Program Rollout Review,” noted the Orbiter Project Office (OPO) at the Johnson Space Center (JSC) on the latest Shuttle Standup/Integration report (L2). UPDATE: Managers have decided to reopen Discovery’s PLBDs to allow for the installation of a container holding 30,000 STS-133 mission patches. The container is being housed on the Orbiter Docking System (ODS) support structure. Engineers claim the late call won’t delay the rollover date at this time.